Sinning Across Spain is the story of Ailsa Piper’s 1300 kilometre walk from the southern city of Granada to Galicia, “the bathtub of Spain”, in the far northwest, carrying an unusual cargo. Aside from 10 kilograms of practicalities, she also lugged a load of sins in her swag. In the tradition of medieval believers, or scammers, who paid others to carry their sins to holy places, and so buy forgiveness, Ailsa asked her colleagues and friends to donate a sin. She then shouldered them across country, being taunted and tempted by them along the way, and trying to discover the mysteries of faith. What is faith? Did she have it? Could she get it? Would she know it if she saw it? 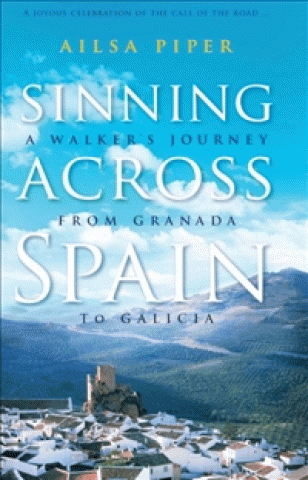 Sinning across Spain celebrates the call of the road, the possibilities for connection, and the simple act of putting one foot down – and then the other, and repeat – for more than a thousand kilometres of dusty road. Started it, didn’t finish. Self-indulgent. Didn’t mind it, good writing; meeting people and country side. Husband died , don’t understand sin. Good read, made me want to go to Spain. Very honest. Good description. I really enjoyed it, loved the poetry and liked the characters she meet. Very enjoyable book, easy read. Loved it! So interesting all the people she met. Found some of it inspiring. Recommend it. Thought it was nice that she did what she wanted to do; just reflect. Mixed feelings; like the walking and meeting people. Didn’t finish it. Interesting travelogue, self-indulgent. This entry was posted in Book Reviews, Non Fiction and tagged Ailsa Piper, book review, Sinning Across Spain by admin. Bookmark the permalink.